The Earth's history shows that the climate has always been changing, over both short-term and long-term time scales. These changes have sometimes been abrupt and severe, without any help from humans. Climate temperature reconstructions are determined from a variety of sources, such as from tree ring width studies and ocean floor sediments. During the last 2 billion years, the Earth has alternated between cool periods like today, and warm periods like when the dinosaurs roamed the planet. The figure below on the left is a temperature reconstruction of the Earth over 2 billion years. Temperatures over this time frame are determined by mapping the distribution of ancient coals, desert deposits, tropical soils, salt and glacial deposits, as well as the distribution of plants and animals that are sensitive to climate, such as alligators, palm trees & mangrove swamps. See here for further information. The above right chart from here shows that CO2 levels have been declining since the end of the Jurassic period to the start on the industrial era. The change in CO2 as indicated by the red line in the red circle is the change in CO2 since the industrial revolution. The graph below shows five million years of climate change by combining measurements from 57 globally distributed deep sea sediment cores. The measured quantity is the oxygen 18 isotope fraction, which is a proxy for temperature. The data is from Lisiecki and Raymo (2005) here. The temperature scale is scaled was established by fitting the reported temperature variations at Vostok, Antarctica to the observed isotope variations, so the temperature scale is representative of Vostok changes. The above graph from here shows 25,000 years of Greenland temperature history determined from the Greenland Ice Sheet Project Two (GISP2). After 5 years of drilling through the ice sheet into the bedrock to July 1993, an 3053 m ice core was recovered. By measuring the ratio of two isotopes of oxygen (specifically 18O to the much more common 16O) one can infer the air temperature at the time that the snow in each annual layer crystallized. This technique is considered quite accurate. Strong, abrupt warming is shown by nearly vertical rise of temperatures, strong cooling by nearly vertical drop of temperatures (Modified from Cuffy and Clow, 1997). Dr. Don Easterbrook writes, "Temperature changes recorded in the GISP2 ice core ... show that the global warming experienced during the past century pales into insignificance when compared to the magnitude of profound climate reversals over the past 25,000 years. In addition, small temperature changes of up to a degree or so, similar to those observed in the 20th century record, occur persistently throughout the ancient climate record. ... Over the past 25,000 years, at least three warming events were 20 to 24 times the magnitude of warming over the past century and four were 6 to 9 times the magnitude of warming over the past century." Ice core results from the North Greenland Eemian Ice Drilling (NEEM) published in January 2013 for the warm period of the last interglacial from 128,000 to 122,000 years ago, known as the Eemian, was 8 +/- 4 °C warmer than the recent millennium. The 2540 m long ice core was drilled during 2008 to 2012. See here. The graph above shows the northern hemisphere temperature history since the last ice age. The graph above shows Greenland temperatures as determined by the GISP2 ice core. It is a detailed version of a previous graph above. see here. The graph above shows temperature variations of the past 3,000 years (during recorded history), as determined from ocean sediment studies in the North Atlantic. [Keigwin, 1996]. Note the rapid variations, as well as the much warmer temperatures 1,000 and 2,500 years ago. A new temperature reconstruction with decadal resolution, covering the last two millennia, is shown above for the extratropical Northern Hemisphere (90-30 N), utilizing many palaeo-temperature proxy records, from Ljungqvist 2010 here. The shading represents 2 standard deviation errors. RWP = Roman Warm Period AD 1-300; DACP = Dark Age Cold Period 300-900; Medieval Warm Period 800-1300; LIA = Little Ice Age 1300-1900; CWP = Current Warm Period 1900-. The proxy data shows that parts of the Roman Warm Period and the Medieval Warm Period were as warm as the 1940s. The Figure 3 of the Ljungqvist 2010 paper shows the HadCRUT3 northern exotropic 1990s decadal temperatures were about 0.15 deg. C higher than the peak of the MWP, however the proxy data did not record the second half 20th century temperature rise. The temperature history shown at the left was published in the first IPCC report in 1990, based on Lamb's estimated climate history of Central England. Clearly, human activity could not have had a significant effect on the temperature changes before 1900. These changes are the result of natural processes. See here for NASA's GISS temperature graphs since 1880. HadCrut4 is the global surface temperature index produced by the Hadley Centre and the Climate Research Unit, England. It combines land and marine temperature data.The graph above from here shows the annual northern hemisphere, southern hemisphere and global surface temperatures from 1850 to 2012. The graph below shows the HadCRUT3 monthly temperatures from 1998. The best line from January 2002 to May 2014 indicates a decline of 0.041 C/decade. The IPCC projected that temperatures would increase by 0.2 C/decade during this period. The HadCRUT3 dataset was discontinued in May 2014. The HadCRUT4 dataset was introduced to add more coverage in the northern polar region. The graph below shows a comparison on the HadCRUT3 and two versions of the HadCRUT4 datasets. The graph below shows the global 21st century temperatures from the HadCRUT4 index, with the best-fit linear trend. There has been a lot of attention of sea ice area because AGW is predicted to warm polar regions much more than other areas. The graph below shows the global sea ice area by month and annualy from satellite data, here. The global sea ice area has been variable with low area in 2006, 2007 and 2011. The sea ice area in 2013 and 2014 was above the 1979-2008 average. The temperature of the Earth has warmed slightly, about 0.8 degrees Celsius, over the 20th century. Over this time, CO2 concentration in the atmosphere has increased, mostly due to the increased use of fossil fuels. However, the Sun has increased in intensity since 1900 which may have induced much of the observed warming since then. Scafetta and West estimate that the Sun may have caused 10 to 20% of the increase in CO2 during the last century. (See page 2 of their paper here.) A short-term correlation does not imply that the CO2 increase caused the temperature increase. Causation can be inferred if there is a correlation over several cycles of CO2 concentration changes, with the CO2 change preceding the temperature change. The actual climate history shows no such correlation, and there is no compelling evidence that the recent rise in temperature was caused by CO2. Temperatures have been variable over time, and do not correlate to CO2 concentration. When CO2 concentrations were 10 times higher than they are now we were in a major ice age. As a greenhouse gas, CO2 is vastly outweighed by (natural) water vapour and clouds, which accounts for over 70% of the greenhouse effect. Human-related CO2 emissions soared after 1940. Yet most of the 20th century's world-wide temperature increase occurred beforehand. 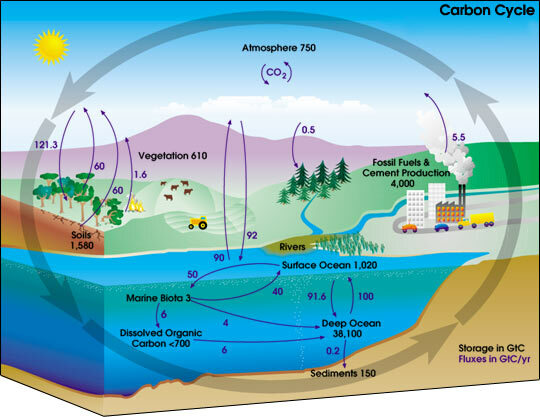 See here for a graphic of the carbon cycle. The CO2 annual growth rate to December 2013 is given below. The actual increase of CO2 concentration averaged 0.5% per year since 1990 and is currently about 0.6%/year. Fischer et al. (1999) examined records of atmospheric CO2 and air temperature derived from Antarctic Vostok ice cores that extended back in time across a quarter of a million years. Over this immense time span, the three most dramatic warming events experienced on earth were those associated with the terminations of the last three ice ages; and for each and every one of these tremendous global warmings, Earth's air temperature rose well before there was any increase in atmospheric CO2. In fact, the air's CO2 content did not begin to rise until 400 to 1,000 years after the planet began to warm. Ice cores provide a detailed record of local temperature and CO2 concentrations. A study by Caillon et al. (2003) finds that the CO2 increase lagged Antarctic deglacial warming by 800 +or- 200 years. The authors measured the isotopic composition of argon40 and CO2 concentration in air bubbles in the Vostok core during the end of the third most recent ice age (Termination III), 240,000 years before the present. The argon40 isotope is found to be an excellent proxy for temperature. The CO2 concentration shown by the black line is plotted against age in years before present (BP) on the bottom axis, and the Argon40, a temperature proxy, shown by the grey line is plotted against age on the top axis. The age scale for the CO2 has been shifted by a constant 800 years to obtain the best correlation of the two data sets. The correlation shows that temperature changes precede CO2 concentration changes by about 800 years. These findings confirm that an increase in CO2 has never initially caused an increase in temperature during a deglaciation. Temperature increases cause the oceans to expel CO2 because CO2 is more soluble in cold water, increasing the CO2 content of the atmosphere. When temperature is at its maximum in each cycle and starts to fall, CO2 concentrations continue to increase for another 800 years! As CO2 increases, temperatures fall. This is the opposite of what one would expect if CO2 were a primary climate driver. The ice core data proves that CO2 is not a primary climate driver. One must invoke reverse time causality to claim the ice core data shows CO2 causes temperature change, like suggesting actions taken today can affect the conquests of Mongol leader Genghis Khan. Logic demands that cause must precede effect. Increases in air temperature drive increases in atmospheric CO2 concentration, and not vice versa. A more recent portion of the Vostok ice core record from Joanne Nova's Skeptics Handbook here is shown below. See here for more information. See here for the Cailion et al (2003) paper. A graph of the Vostok ice core data over 420,000 years is shown below. A large version is here.